Vision Apartments Lausanne price per day from CHF 160 A 15-minute walk from Lausanne Train Station, Vision Apartments Rue Caroline offers spacious apartments in the centre of Lausanne. Maid service including waste disposal and exchange of towels is provided for stays longer than 6 nights. Studio Falk Montreux price per day from CHF 120 This spacious studio in Montreux is just a 3-minute walk from Clarens Train Station, a shopping mall, and a beach at Lake Geneva. It offers free Wi-Fi and a large south-facing balconyLocated on the 4th floor of a building with a lift, Studio Falk Montreux features cable TV, a DVD player, a kitchen with a dining area, and a bathroom. 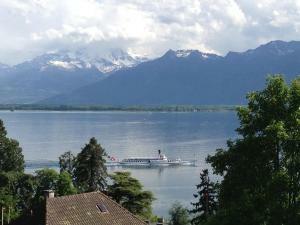 Suisse Riviera Elegance This large and elegant apartment in Montreux is just a 10-minute walk from Lake Geneva. It offers free WiFi and a balcony with lake and mountain views. Château d\ price per day from € 188 The Château d'Ouchy is a renovated medieval castle with an original donjon (keep) in a beautiful location in Lausanne, directly on the shores of Lake Geneva. Enjoy the Mediterranean restaurant, the cosy bar, the modern leisure area with pool, sauna and hammam, and the pleasant terrace facing the lake..
Agora Swiss Night price per day from € 98 The Agora Swiss Night is located in a quiet and green area of Lausanne and offers a modern spa and fitness area. All rooms are air-conditioned and feature large windows overlooking the garden, coffee and tea-making facilities and a flat-screen TV with 200 international channels. Town of Chiesaz (Blonay - Chiesaz: 1.3 km). Town of Chatelard (Blonay - Chatelard: 2.4 km). 2+ apartments ! Town of Montreux (Blonay - Montreux: 3.8 km). 37+ apartments, 5+ villas ! Town of Vevey (Blonay - Vevey: 4.5 km). 5+ apartments ! Town of Chardonne (Blonay - Chardonne: 5.7 km). 2+ accommodation units ! Town of Villeneuve (Blonay - Villeneuve: 8.1 km). 5+ accommodation units ! Town of Chexbres (Blonay - Chexbres: 9.6 km). 2+ accommodation units ! Town of Geneva (Blonay - Geneva: 65.1 km). 50+ apartments ! Town of Bern (Blonay - Bern: 66.1 km). 20+ apartments ! Town of Zermatt (Blonay - Zermatt: 82 km). 589+ apartments !